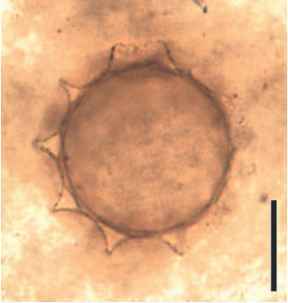 vegetative reproduction; as a result, the phycoma increases in size over time. Prasinophycean phycomata have decay-resistant walls and thus have preservation potential as fossils (Quintavalle and Playford, 2006) (FIG. 4.3); the oldest persuasive specimens come from the Precambrian and are more than 1.2 Ga old (reviewed in Teyssèdre, 2006). The majority of fossil phycomata have been described from strata deposited in marine or brackish water, but there are also several reports of these structures from freshwater deposits (Dotzler et al., 2007). Phycomata assigned to the genus Cymatiosphaera (>200 species currently recognized) are globular (spherical-ellipsoidal) vesicles, up to 100|m in diameter, with the external surface divided into a polygonal reticulum by membranous expansions or muri, which are perpendicular to the surface (FIG. 4.4). Cymatiosphaera fossils are structurally similar to the reticulate forms within the extant prasinophycean genus Pterosperma (Colbath and Grenfell, 1995). 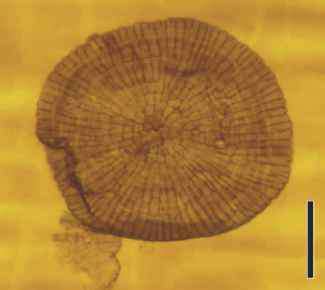 Phycomata with a surface reticulum (Cymatiosphaeraceae) are present at least by the Ordovician (Tappan, 1980). They diversified extensively in the Devonian and later Paleozoic but are rare in Mesozoic and Cenozoic rocks. Because pra-sinophytes are most abundant in the absence of other phy-toplankton, they became less important when dinoflagellates and other algal groups diversified during these periods. One hypothesis suggests that blooms of prasinophytes and acri-tarchs observed across the Triassic-Jurassic boundary are in response to rapid CO) increases which acidified the upper ocean and thus reduced the ability of other organisms to calcify (van de Schootbrugge et al., 2007). preserved as compressed cysts, usually ranging from 100 to 600 pm in diameter. Haptotypic features are absent, but the surface is covered by numerous, regularly spaced punctae or small pits. Ultrathin sections of the wall show concentric banding and two types of pores which traverse the wall in a radiating pattern (Jux, 1968). The affinities of Tasmanites have remained in doubt since the original description by Newton in 1875. Most researchers now believe, however, that these microfossils represent the phycomata of planktonic prasinophytes. Guy-Ohlson (1988), using a variety of techniques, was able to demonstrate the life history of Tasmanites based on specimens of Toarcian (Early Jurassic) age from southern Sweden. Her investigation substantiates the affinities of Tasmanites with the modern prasinophycean algae Pachysphaera, Halosphaera, and Pterosphaera.